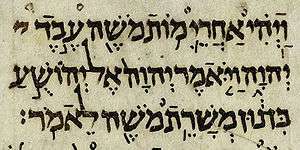 I, II, and III Meqabyan (Ge'ez: መቃብያን, sometimes spelled Makabian) are three books in the Ethiopian Orthodox Old Testament Biblical canon. Although these books are completely different in content from the books of Maccabees in Catholic and Eastern Orthodox Bibles, they are sometimes referred to as Ethiopic Maccabees or Ethiopian Maccabees. The "Maccabees" described in these books are not those of the Hasmonean dynasty, and the "Five Holy Maccabean Martyrs" here do not correspond to the martyred "woman with seven sons", who were also referred to as "Maccabees" and are revered throughout Orthodoxy as the "Holy Maccabean Martyrs". These three books long existed only in Ge'ez, but have recently been translated into standard English by Feqade Selassie. The Book of First Meqabyan has 36 chapters. It begins: "In the days of the Moabites and Medes". It says that there was an idol-worshiping king of Media and Midian, named '"Tsirutsaydan". This was an actual nickname of the historical Seleucid king Antiochus IV Epiphanes, who sometimes held court at Tyre, after he began minting coins with the names "Tyre and Sidon" (Tsur u Tsaydan) stamped in Canaanite alongside his image. According to this book, a Benjamite called Meqabis (Maccabeus) taught that men should worship the true God. His 5 sons ('Abya, Seela, Fentos, and 2 others), as well as other people, were burnt to death by the king. The historical Maccabees are referred to again in Chapter 15, which describes the three brothers Judas, Meqabis (Simon Maccabaeus) and Mebikyas (Jonathan Maccabee) as leading a successful revolt against the evil king Akrandis of Midian, who was oppressing Israel. Here, Mebikyas enters Akrandis' camp and decapitates him at his dinnertable, food still in his mouth, while Judas and Meqabis defeat the king's armies in the field. The Book of Second Meqabyan has 21 chapters. It begins: "After he found the Jews in Syrian Mesopotamia". It says that a king of Moab named Meqabis made war against Israel as a punishment on them. Later he repented of his sins and taught the Israelites God's law. After his death, Tsirutsaydan introduced idolatry and burnt the sons of Meqabis. The Book of Third Meqabyan has 10 chapters. It begins: "And the islands of Egypt shall rejoice". It is a diffuse account of salvation and punishment, illustrated from the lives of Adam, Job, David and others. ↑ John Mason Harden, An Introduction to Ethiopic Christian Literature, 1926, p. 38; Ernst Hammerschmidt, Äthiopien: Christliches Reich zwischen gestern und morgen, 1967, p. 105.